Can you believe it’s almost November?! 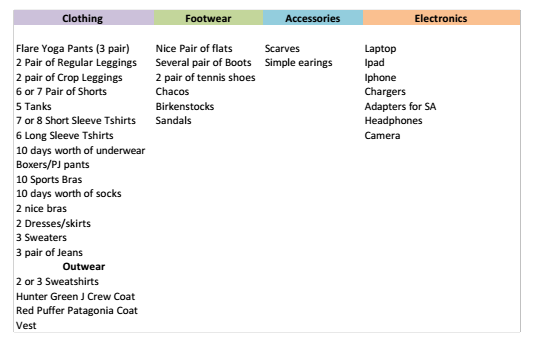 Of course, this is A) a packing list for a girl, and B) a packing list for cooler weather. Boys: don’t worry — a “what to wear/what to pack” list will be coming just for you! If you’re going on the Cape Town trip — the biggest advice we can give is that you pack more warm clothes than you think you will need. If you’re going on the Greece trip or the Rome trip — you will need to bring summer clothes! Lucky you! Swimsuits, tons of dresses and dressy tops…you get the idea from reading the What to Wear series. As for electronics etc., this packing list has it covered. Make sure that you also bring with you any school supplies you might need. This includes the Blue Book that you will receive in the mail prior to departure, pens, a notebook, and a folder. Of course, you’ll also need your money, your passport, and all of your travel papers. Soon, be on the lookout for a post about what to bring with you on your flight and a post about everything luggage related.